This year I thought it would be fun to give my grandmother a digital photo frame so she can have her grandchildren on constant rotation. I KNOW this would NEVER be something she would ever get on her own. That woman still has a rotary phone for Pete’s sake! But, if she were to receive one pre-programed, I KNEW it would be a hit. I headed to Staples to check out what they had in stock and was able to choose between several brands. I ended up picking the PanDigital PanImage 10.1″ LED-Backlit Digital Picture Frame because you can store around 2500 pictures with this model. That’s how many pictures I take when I go food shopping with the kids. TRUST ME I HAVE ISSUES!!! My mother has also been hinting that she wants a digital camera. 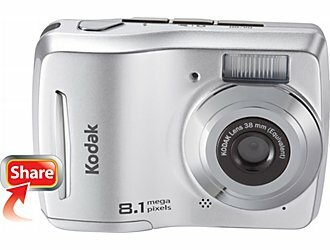 I opted for the Kodak EasyShare C122 Digital Camera because for $49.99 it cannot be beat!!! My friend Audrey gifted me with a $200 Staples Gift Card and I REALLY put it to good use. With what’s left on the card I was able to get myself some MUCH NEEDED office supplies. Did you purchase any tech gifts this year? Did you consider Staples as your source? I gifted myself with a Nook Color Ereader. I’m still learning how to work it but so far it’s awesome. 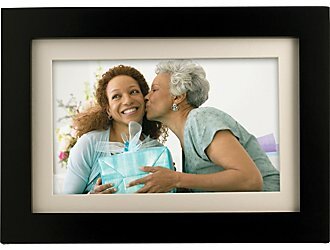 And I bought my mom a Pandigital digital photo frame for Christmas.